According to the International Bowling Museum and Hall of Fame, a British anthropologist discovered in the 1930s evidence of bowling items in an Egyptian grave. The evidence suggests bowling dates back as far as 3200 BC. Indoor bowling lanes made their debut in 1840 in New York City. In 1905, the wooden ball loses ground to rubber ones. Bowling made its television debut in the 1950s. Automatic pin spotters or pin setters are introduced in 1952, slowly leading to the decline of pin boys. The first indoor bowling lanes were built in New York City in 1840. 70 million people bowled at least once in 2011. There is no minimum weight for a bowling ball. A ham bone is one better with four strikes in a row. Up that lucky strike series to 6 in a row, and you’ve got a wild turkey. Even better is a Golden Turkey at nine strikes in a row. A Deuce is a game of 200 or more. Bowling balls were made out of wood until the early 1900s. The largest bowling center is located in Japan. It has 141 lanes! Bowling raises over $225 million a year for charity. Walter Ray Williams is perhaps the most famous Professional Bowling Association (PBA) bowler. He’s got the high score and the fan club to prove it. Don Carter is the first bowler to land a million dollar endorsement. Bill Allen was the first bowler to be inducted into the PBA Hall of Fame (1983). Earl Anthony is named as the PBA’s Greatest Player of the Past 50 years. Kelly Kulick is the first woman to win a title on the Professional Bowlers Association Tour (2010). The maximum number of holes allowed in a bowling ball is 12. Bowling is the number one participation sport in America. There are presently 89 PBA Hall of Famers (only 1 is a woman and she was inducted for meritorious service). In 2008, bowling alleys were voted by the Daily Finance as #11 in the Top 25 things vanishing from America. 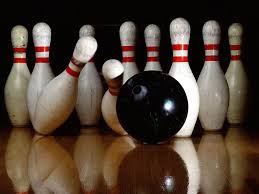 A bowling ball can weight between 6 and 16 pounds. The PBA has approximately 4,300 members. Bowling shoes generally come in sizes 6.5 to 15 for men and in sizes 5–11 for women. The youngest person to bowl a 300 game was Chaz Dennis at the age of 10 years, 2 months in Columbus, OH. The origins of bowling can be traced about 5,000 years back to Rome and Greece. According to the Guinness World Records, Japan is home of the largest bowling alley in the world. Inazawa Grand Bowling Centre has 116 lanes. The second largest bowling center is in Las Vegas, Nevada. Seattle, Washington is the headquarter of the PBA. The 13 countries with membership in the PBA include the United States, Australia, Bermuda, Canada, China, England, Finland, France, Germany, Japan, Korea, Sweden and Venezuela. Reno, Nevada is home to a bowling stadium....not just a bowling center, an actual stadium!